The crew enjoy a visit from the Sri Lankan Navy a tropical sunset – and a shampoo! A beautiful day at sea. 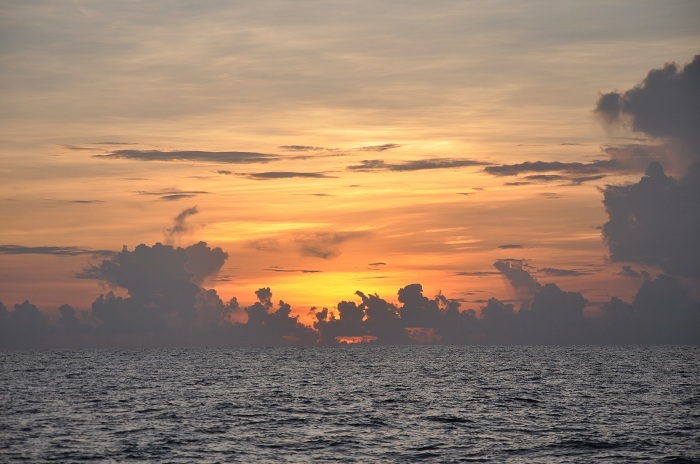 One of the great pleasures of sailing in tropical waters is the ever-changing cloud formations–especially at dawn and dusk when the clouds turn many shades of yellow, orange, red, and blue. Of course they can also bring rain, and this morning began with a brief but heavy downpour. Several members of the crew took advantage of the fresh water to enjoy their first shampoo since leaving Cochin. The winds have been light today and we are still approximately 60 nautical miles from Galle. We had hoped to arrive before dark tomorrow, so if the weather cooperates there is still a good change we can cover that distance by tomorrow afternoon. At this point there is little we can do but hope for fair winds to begin soon. Although this leg of the voyage has been much shorter than the first (from Muscat to Cochin), it has nevertheless been a tiring trip, and the crew is very much looking forward to cool showers, clean beds and a full night’s sleep. The highlight of the day came in the late afternoon when two patrol boats from the Sri Lankan Navy visited the Jewel of Muscat. They brought with them much-welcomed gifts of fresh fruit and cold juices which put the crew in high spirits. In return, Captain Saleh sent them packages of Omani dates and we all cheered our gratitude as the Sri Lankans pulled away and headed back to port.